The Ministry of Youth and Sports (MOYS), has initiated a partnership with the Ministry of Education, that will see to the revival of school sports. The move, is aimed at combining sports and academics for the future leaders and to serves as a tool for job creation and crime prevention and development of young talents..
Mr. Isaac Kwame Asiamah, Minister for Youth and Sports said, a committee headed by Mr. Perry Okudzeto, Deputy Minister for Youth and Sports, had been inaugurated to oversee to the implementation of the partnership. The Member of Parliament for the Atwima Mponua constituency made this known, when Madam Anne Sophie Ave, French Ambassador to Ghana, paid a courtesy call on him to discuss issues towards the development of youth and sports in Ghana. Madam Anne, who took the opportunity of her visit to invite Mr. Asiamah for a sports competition slated for May 10, 2019, which would include six schools from Ghana between the ages of eight to twelve noted the importance of volunteerism, adding that the French Embassy was undertaking a project, where volunteers would be brought to Ghana to teach individuals and organizations the basics in French language. 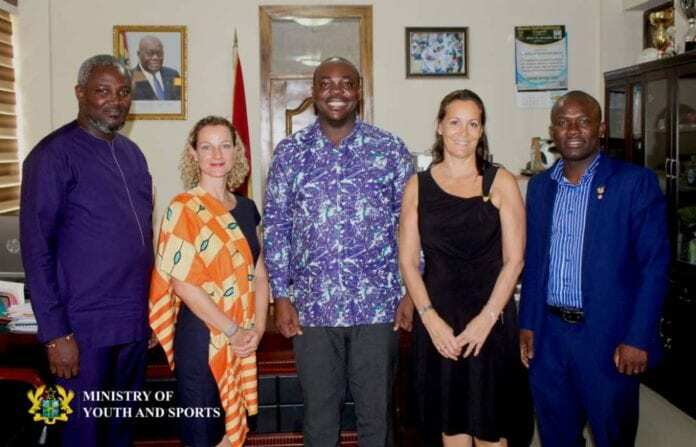 Mr. Asiamah, who called on the French Government to support the school sports initiative also lauded the French Government for initiating the volunteerism project and expressed gratitude to Madam Anne and her entourage for what he described as an august visit. Mr. Asiamah said, the ministry would support the project and would contribute its quota to make it a success.